The dining room was a beautiful tent that reminded me of being in an actual Moroccan restaurant with all of the brightly colored fabrics and Berber carpets lining the walls and floors. Best part, the meal was tasty. We ended the night being entertained by the guys who worked the campsite, 2 tour guides, and the camel herder who all sang and played random instruments. The next morning we climbed the sand dune before sunrise to take in an unbelievable sight. Honestly, didn’t think we’d make it to the top because it was like walking up quicksand, but somehow miraculously we did. If you go and want to catch sunrise, my advice is to get at least a 30 minute head start because it takes a long time to walk up a sand dune. 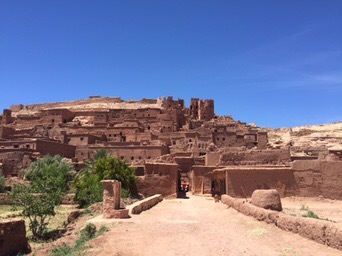 back to Marrakech, stopping at a famous movie set and Aït Benhaddou, a huge casbah, along the way. It took us about an hour to walk through the compound to reach the top. There were a few cool artisans selling their wares which is probably why it took so long. It was nice to see where the Moroccans that look like me live in the more Southern parts of the country. 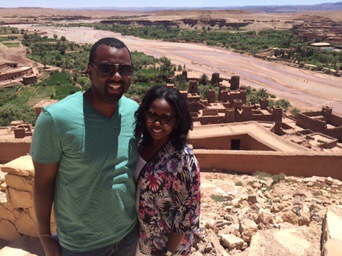 We made it back to Marrakech late that evening. If you have time, I highly recommend taking a 3 day Zagora Dunes trip to get a taste of the Sahara Desert. After all of that, all we wanted to do was relax. Not sure when I started this but I like to go to the spa when traveling abroad, I especially love the hammam experience. After reviewing my go to TripAdvisor, I came across Heritage Spa. Well in advance, I booked the traditional hammam service which included a full body scrub plus a massage for my husband and I. We had our own private room and they gave us the option of what kind of scrub we wanted. I went with the Moroccan black soap. When I say they scrubbed every single impurity from my body, from head to toe, that would not be an understatement. The massage was a welcome benefit after the long 2 days we had driving down to the south of Morocco. The Jemaa el-Fnaa is a huge market place filled with locals and tourists alike. I’d received a lot of warnings about going there so I was basically prepared for anything and everything. Don’t pay full price for anything, negotiate, negotiate, negotiate. If they don’t accept what you’re willing to offer, walk away as there will be plenty other vendors selling the same thing. Don’t let anyone lead you anywhere. This is the biggest setup. This place is truly a maze and if you’re not careful you will get disoriented. This is a known trick. They will get you lost and demand money. Fortunately, my husband is a human compass and rarely gets lost so we were free to roam the souk and made it out without incident. 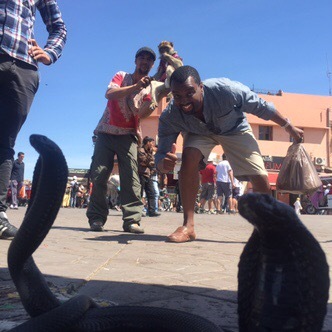 If you choose to take a photo with cobras, monkeys, or whatever else be prepared to pay. Nothing is free! Have your money out and ready. Be prepared for someone to take your phone/camera to get the money shot, literally. In the photo above, I was at least 20 feet away but my husband wanted to have his photo taken. The guy who took this picture tried to demand we give him $10, we were like here’s $2, snatched our camera back and kept it moving. Even if you’re trying to take a photo off in the distance people are watching and will demand you pay them. Just say no and kwalk away, don’t let them intimidate you. cooking class. We decided on doing the latter. There were a ton of options but I decided on a class that would allow us to actually go to a local market to select our own meats, vegetables, spices, etc. Moroccan markets are definitely not for the faint of heart. First of all, most stuff is fresh so it’s just hanging out, meat included. Everywhere you looked you saw lamb, cows, chickens, pigeons, you name it and of course all of the fruits and veggies were organic. We ended up making a traditional salad, lamb tajine, chicken stew, and a fresh strawberry lemonade. Our last night we decided on celebrating the end of an amazing journey by having dinner at one of the top restaurants in Marrakech, Gastro MK. I booked reservations a few weeks in advance because there are only two seatings per night and the capacity is extremely limited. From the moment we arrived, we were treated like royalty. We were allowed the select our seat then taken to the rooftop for cocktails and amuse-bouche. After about 30 minutes we were led back down to our table where we enjoyed multiple courses. The Moroccan-born chef had been trained at top restaurants outside of Morocco so he brought a unique flavor to all of his dishes. At the end of the night, he came over to greet each table, I believe there were only 6, and asked us what we thought as well if we had any comments or suggestions. That is so rare these days. This meal was definitely the highlight of our trip and was incredibly affordable by US standards. In case you’re interested, below are some contacts from our trip.